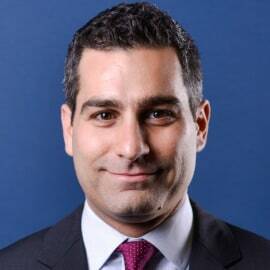 Dan Shapiro serves as Vice President of Strategy & Business Development for William Hill US, the largest sports book operator in Nevada. Prior to that role, Dan was Director of Marketing for the first year of William Hill’s Nevada operation and oversaw the initial brand launch. Before joining William Hill, Dan was part of the original management team of Brandywine Bookmaking d/b/a Lucky’s Race & Sports Book, a startup sports betting company that William Hill acquired in 2012. Before moving to Las Vegas, Dan held various roles in the horse racing industry. Dan holds an MBA from UCLA’s Anderson School of Management and a BS from Boston University. Dan was named one of the “40 Under 40” emerging leaders in the gaming industry by Global Gaming Business Magazine.